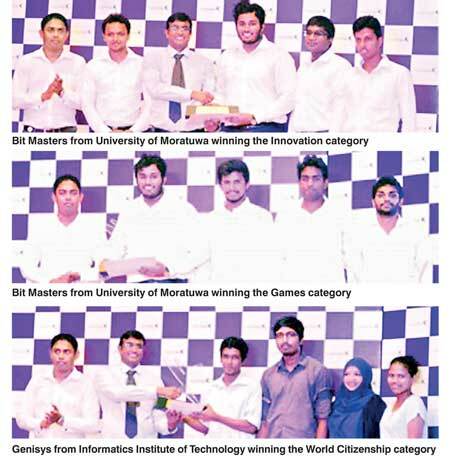 BitMasters, a team of students from the University of Moratuwa, were adjudged winners in two categories at the Sri Lankan finals of Imagine Cup 2016, the world’s premier student technology competition organised by Microsoft Corporation. BitMasters dominated both the innovation and gaming categories while Team Genisys from Informatics Institute of Technology (IIT) were declared winners in the world citizenship category. ‘Project Amplus’ from BitMasters won the top award in the innovation category. It is an intelligent digital signage platform that makes outdoor and indoor advertising more accessible for local businesses. The team has already installed several Amplus devices in a number of shops across Sri Lanka. Their cross-platform game ‘Ashes of History’ which includes several modern gaming aspects like gesture control won in the gaming category. Team Genisys from IIT presented their smart water bottle holder which reminds users to consume water to stay healthy. This world citizenship category winning solution also provides customised water goals for users by analysing the height, weight and body type of the user. Microsoft Imagine cup was held for the twelfth consecutive year in Sri Lanka with the participation of over 200 teams from leading state and private universities. Since 2005, students have submitted creative and ingenious ideas which have later translated into successful businesses. This year’s competition had over 200 submissions out of which 22 teams qualified to participate in the Sri Lankan finals. Imagine Cup is an annual event hosted by Microsoft internationally to identify, recognise and reward great student innovators.